You may be confused by the difference between palliative care and hospice care. You may know that these types of care are reserved for those that are seriously ill, but you may be unclear on the rest. Can patients get care if they are trying to get better? Or do patients go to these types of care facilities to get assistance with dying? Misconceptions abound about them both. Hospice care is a type of care that focused on providing comfort to someone in the last stage of life. Typically, these people have a prognosis of six months or less to live. They may have exhausted their treatment options, or they may have decided that they no longer wish to pursue treatment. Palliative care also focuses on making patients comfortable, but it is available to those who do not have a terminal prognosis, as well as those who are still pursuing treatment. For example, someone who is getting chemotherapy may want palliative care to assuage some of the symptoms of that intensive treatment. Tempe Hospice care is provided by a team of professionals. That can include doctors, nurses, counselors, social workers, spiritual figures, and family members. The goal of hospice care is to address not only the physical pain that a patient is suffering, but also to help them through their emotional distress, spiritual issues, family issues, financial issues, and more. Alternative therapies may also be provided, such as music therapy, aromatherapy, reiki, reflexology, meditation, acupuncture, art therapy, and more. The end-of-life hospice care near Tempe plan will be tailored to the needs of the patient and the patient’s family. What one family needs will not be what another family needs. You must work closely with your hospice team to determine the appropriate plan of care for your loved one and your family. Hospice care can be provided in a variety of locations, depending on the needs and preferences of the patient. Hospice care can be provided in the home, but it can also be provided in a hospital or at a long-term care facility, such as a nursing home or an intensive care facility. The hospice team will go wherever the patient is. Determining the right location has more to do with the patient’s medical needs than where hospice care would be available. For example, some patients need to stay connected to specialty equipment that is best provided at a hospital. However, most patients can enjoy their last days at home if they choose to do so. Know that the patient isn’t the only one who needs end-of-life hospice care. Family members also need help processing their feelings of grief, as well as coping with the changes they see in their loved one at the end of life. Patients can often become withdrawn, agitated, restless, and even angry. They may also become confused or delusional. These changes can be very hard for family members to deal with or accept. Hospice care workers can also help families through the stress of caring for a sick loved one, can help them work through financial difficulties, or can counsel them on the spiritual crises that might occur when a loved one becomes seriously ill. Facing the end of life for yourself or for a loved one is a major transition, and it can be hard to deal with all the changes that take place. Hospice care helps you and your whole family through this time with as much peace and dignity as is possible. 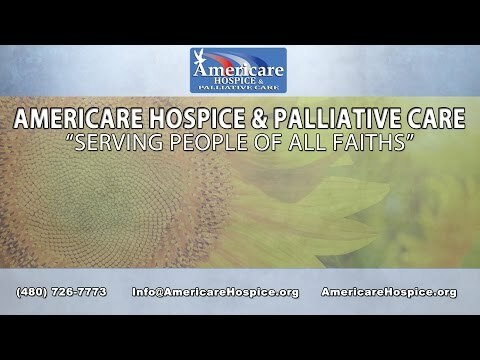 Americare Hospice and Palliative Care offers services throughout Arizona, both at patients’ homes and at care facilities. Our providers take a comprehensive approach to end-of-life hospice care, focusing not just on relieving the physical pain of the patients, but rather on overall wellness and peace of the patient and the whole family. We offer psychological and spiritual counseling, bereavement support, and much more. Contact us in Arizona today to learn more about our hospice care and to discuss the needs of your loved one.